I can’t imagine why anyone would ever have filmed this. Especially in the pre-smart phone era. Upvotes for whoever can find some footage! Someone must still have one of those printers and a hookup, right? Somewhere? Likely not for sale, cuz of the SMALL interest and higher cost. But also not sure if what you're asking.. You want just a video of a printer printing anything? (Those exist on YouTube already..) or to see what the output looks like? Ah! Okay. Gimme a little bit - a week or so, and I can capture output from my TZ and post it. 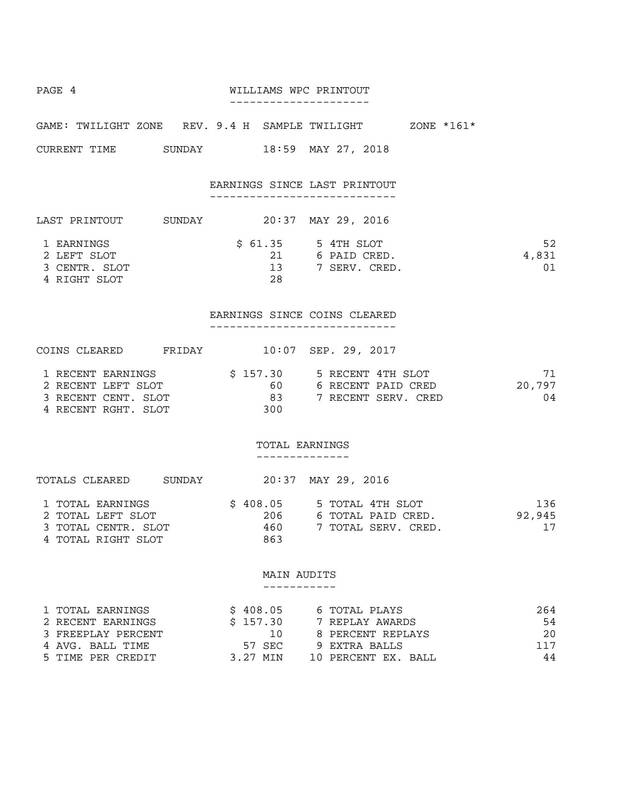 Note that the printouts are only the bookkeeping information - No live stats (current High Scores, current ball in play, etc) are given in the readouts. In fact, for serial connections, the serial data transfer takes so much CPU resources that even with the 'auto' printout set to enable, the game will not print out anything while a game is in session. Sorry for the delay. I had forgotten about this until I was messing in my basement today. I attached a PDF file. This is the printout using "P.8 ALL DATA" option. It's the same as printing out P1 - P7, except with one difference - if you print out just P.1, you get an additional line stating when the Time & Date was last changed. (Can't upload a PDF because Pinside does not allow TXT files. (Strangely..) Also, it's a bug that it starts on 'Page 4'. If you print out the sections manually, they start at the proper number (1). Very interesting stuff, Coyote! Quick question: Line 6 of the Total Earnings is 92,945. Does this number mean that the game DOES have a universal counter like the way the EMs had with their physical game counters? Or does it just mean that you've never accidentally cleared your bookkeeping stuff due to power outage when the batteries were actually dead or you forgot to turn your game on when changing the batteries? If you just want to see the output you can run it in pinmame, there it will export the output to a file. I have a single-slot coin door, which has an electronic coin mech in it. It accepts all coins, including $.50 pieces. DBA accepts $1 - $20s, wired to 4th slot. Anyways - 1 credit is 10 units, 1 unit is $.05 in value. The OS in 9.4H was one of the latest - if not last - version of the OS for WPC-89 (pre -S) games, and when Ted put the old game cod on the new OS, likely something is just getting recorded incorrectly in NVRAM because of that. 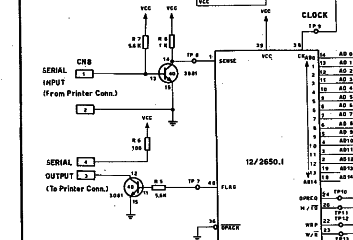 But to answer your question - no, there is no value in WPC-89 (including -S) that is non-volatile - if you change the ROM out, or do a factory resent, everything is cleared. Including those totals. Plus - how can my game have only made $61.35 since the last printout on 5/29/16, but made $157.30 since 9/29/17? Something is off, and it's likely why this is a home-only version of the ROM. As an operator, I'd be really annoyed if I couldn't trust the readouts. Once I fix the issues in my printer board, and can install it permanently, I may do some factory resets, and test some things to find out WHY that number is so high.. So then... might you consider sharing the design for those others who might like to tinker one together? Yeah, I probably would. Or have a small batch of them made - would depend on costs. (3) Pull out an SD card from the expansion board to copy a file off of it containing the data? If #2, would you want the pinball connected by WiFi or Ethernet? Or does it matter? 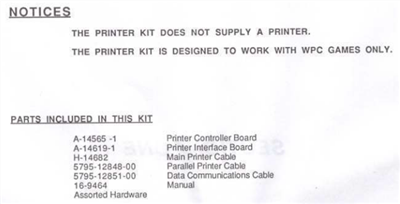 But I still have/use printers with a 'real' serial connection, so what do I know? So this project is more a learning experience, to get me familiar with micro-controllers. I decided the final 'board' will have a Micro-USB port for connecting to and connecting by a serial port. But, it will also have a XBee plug that will allow a mesh network connection, Wifi module, or BT module plugged in and configured. I very likely won't have them mass-produced, since.. well, I'll be surprised if 5 people are interested, much less 100. Right now, I'm trying to focus on the uC talking/watching the WPC data lines.